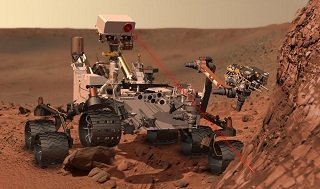 NASA’s Mars Curiosity Rover is scheduled to land on the red planet at 5.31pm on Monday 6 August and you’re invited to Carter Observatory to witness this scientifically significant event hosted live by Carter and their colleagues from the KiwiSpace Foundation (if Curiosity survives its descent to the Martian surface that is…). This special event will be running from 4.30pm with insights provided by the KiwiMars crew, followed by the live link up to that last “7 minutes of terror” as the rover descends onto the planet surface. This will be a great opportunity to learn about humankind’s next steps into space exploration, with the rover’s objectives including searching for past or present life, studying the Martian climate and geology, and collecting data for a future manned mission to Mars. (Note that the last planetarium show that day will be at 3pm so if you go up after that to watch the event admission will be on an exhibition only ticket basis: $10 adults / $ 8 concessions / $4 children / free entry to Star Pass holders).